Only 1 of 100 recommendations in Coroner’s suicide report followed. For better or worse, I’m not on a reporter’s schedule. And not being in a hurry means that the picture that I’m slowly starting to reveal is much more complex than my headline would have made it out to be. Work to build a new school began in November, according to a press release from MP Greg Rickford’s office. Building a school “as soon as possible” was one of the recommendations in the Chief Coroner’s report that the Pikangikum First Nation identified as a key follow-up step. Secondly, the Government of Canada’s FedNor announced on Nov. 10 an investment of nearly $300,000 for further research into the viability of a proposed sawmill, as part of the First Nation’s Whitefeather Forestry project. In June, Pikangikum Chief Paddy Peters refused to allow a polling station in the community for the Ontario election, accusing all candidates of neglecting the community, specifically the forestry project, which he said had been in development for 17 years. In addition, I have not heard of any suicides in Pikangikum since 2011, though I haven’t been able to confirm that yet. These are positive signs, but just that: life in the remote community is not suddenly trouble-free. According to reports, young children continue to sniff gasoline and housing remains woefully inadequate. It has been difficult getting enough information to assess the theory that is slowly starting to grow in my head about the follow-up to the suicides in Pikangikum: that it will take a vast amount of resources and many years to rebuild this damaged community. Which leads – probably prematurely – to this question: will every broken community require the same sustained focus and energy as Pikangikum. And are we prepared to make that effort? I can’t answer those questions. I might be better able if someone from the MP’s office, the MPP’s office, the group that wrote the coroner’s report, the First Nation, local health authority and some of the other agencies that I’ve contacted would talk to me. In future posts, I’ll flesh out details about this issue, including responses I have received: from Health Canada, the Ontario Ministry of Child and Youth Services and Aboriginal Affairs and Northern Development Canada. 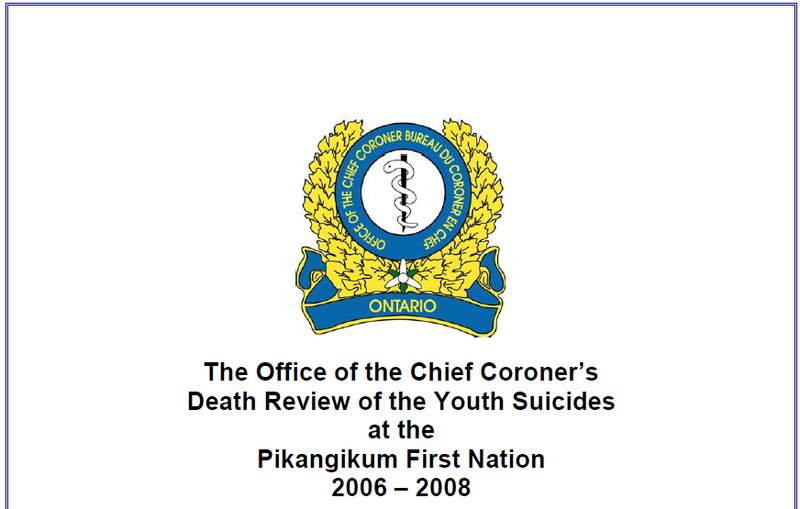 This entry was posted in Aboriginal, Canada, First Nations, Indigenous Peoples, Suicide and tagged indigenous youth suicide, Pikangikum, remote indigenous communities by martylogan. Bookmark the permalink.